Show off your love for your favorite epic space opera with the comfy-cute style of this Star Wars Tie-Front Graphic Tank Top. This tank top features the Star Wars logo in a retro-style font on the front, above a vintage print of Han Solo, Lando Calrissian, Chewbacca, Princess Leia and the ship that made the Kessel Run in 12 parsecs, the iconic Millennium Falcon. It has a knot-tie accent at the center of the hem for a pop of texture, along with a shorter, cropped fit that pairs perfectly with high-rise bottoms. 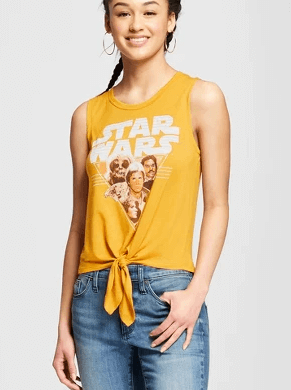 Whether you’re headed off to watch the latest Star Wars movie or relaxing on the weekend, this Star Wars tie-front tank top is a great go-to top for all your space-themed looks.